Where is the Rail station? Well, something already exists. Jigani/E-City industrial areas in 5 (local shuttle to bring me to station) + 15 mins (to E-City station) + 10 minutes (shuttle to drop to office) = 30 minutes of clean green commute. This one is even better and amazing. Sarjapur Road suburb to city-center (Cantonement) in 35 minutes not more. 5 mins (shuttle to station) + 20 mins (train ride) + 10 minutes (shuttle to destination in CBD). This one is bit like stretching it, but did you say you work in Yelahanka, and wife in Jigani? Worry not, its possible. Now that you got a hang o it, the route is predictable. 50 mins to Yelahanka? 5 mins shuttle + 35 minutes train + 10 minutes shuttle at other end. But possibilities exist, residents of the areas that will get the windfall, and our city needs to drum this up with railways. Why should all the long distance trains come all the way into the center of the city? Is't KSRTC doing satellite bus stations on the pripheries of the city? Why would we not push railways to leave tracks inside the city for better more practical use by commuter rail? Roads get widened by acquiring nearby houses - look what is being done to Outer Ring Road in dense places like Jalahalli and BTM Layout. Why can't these tracks be doubled via such "widening"? Ask one of your old relatives who worked at HAL. They actually had a commuter train coming all the way till HAL area! My office is just after this track on ORR and have not seen any train passing by. Almost always track will be idle. I know Tanjavur and Tuticorn express pass here. I don't know why the reluctance of railways to start commuter rail. My office commute from BSK III stg to here via Nayandahalli Station to here would be half hour + 15 minutes probably bike/car/BMTC commute to Nayandahalli Station as opposed to current 1 hour 30 minutes to 2 hours as of now. Another thought is that there is plenty of military and HAL space between Silkboard and Marathalli towards north of ORR. If a train track for light rail can be laid at grade by BMRC without any stops in between, or probably only one or two stations, it would result in just 10 - 15 minute commute from Silkboard to Marathalli. It can be extended further to ITPL which is the high density traffic. Currently it takes almost 45 minutes to 1 hour from Silkboard to Marathalli on my commute using Volvo 500K. Which is why most cities are building Metros. IR sees city services as bleeders. They cannot charge profitable rates as they are constrained by the fares set up by Mamata didi or whoever else is the RM. For them this is a big distraction that does not give adequate returns (I have a friend who is ex Railways and he was telling me this). They will simply feed any such idea into their bureaucracy and let that monster take over. SY, not just cost, feasibilty as well. I do not agree that IR is not interested in CRS. IR divisions ( some of the zones) may not believe that CRS is worth the cost. A more correct assessment is that it not feasible. Our cities building Metros are not because of IR interest (or the lack of it) in CRS. CRS is not practical / practical replacement for Metro in a city like Bangalore. There is some minimal CRS effort in Hyderabad (MMTS) and we see that next stages are also being planned. But the capacity of the system is not comparable with even a half-Metro system. The main problem is the availability of dedicated lines to run these routes, without disturbing the existing services. In today Bangalore, we just dont have enough 'cost-efficient' land available along the existing tracks to build further lines and widen the railway bridges/RoBs/RuBs. In a city like Mumbai, we had enough space available a few decades back and hence we are having the trains running. Today, since there is no land vailable to build similar lines afresh, we are going on with the Metro and mono options even there. Another factor to be considered in the discussion is the zones and their HQs. Most public agencies in bangalore have woken up to the realities/challenges of the city ( not discussing the fruits, but just the intent/effort). If only we had the SWR headquartered here, we would have had one or two small CRS intiatives here ( say an hourly train to EC or Airport, but definitely not Mumbai like local train). Why not rent out railway tracks? 1. Rent out tracks (and possibly depots) , during idle time, to private parties for them to run city services. 2. If renting out to private parties offends our babus' sensitivities, they can rent out tracks to the state-run metro BMRCL so that they can run their metro cars on those tracks (which is doubtful because of the gauge difference) or provide commuter services with their own broad gauge cars with interchanges to the metro. CRS is not expected to "replace" Metro. It "complements". Infact this could become another colored line on the metro map, since it connects metro stations across town. Also nobody is interested in IR/SWR running services, we would rather have a single entity running the CRS trains as well under a single system. Some cities like Hyderabad have managed to get IR to invest in CRS. But I think BMRC should be able to run this. All we need are their tracks to be shared for running trains inside city limits. The standard excuse from SWR has been the lines are loaded and there is no bandwidth. Some rerouting and adjustment is in order. Block sizes are also too large to handle city services which need more stations and smaller block sizes. Investment in signalling, stations and different rolling stock is required. Terminating trains can be made to stop in Yeswantpur KR Puram etc. to enable bandwidth. Pass thru only need to be allowed to the city. This is an overview on the map of Silboard to Marathalli rail route non - stop at grade via defense land. There should be no station in the defense land. Route is around 9 kms. At 50kph, it should not take more than 15 minutes to reach Marathalli from Silkboard. As part of Phase 3(!!! ), I think it would be advisable to build a Metro line from Mysore Road to ITPL along ORR with an interchange at Silkboard with the Phase 2(!!!) line from Yelahanka to E-City. The number of big IT offices along ORR starting from Bellandur till Marathahalli is quite big and ITPL itself is a massive sink for people commuting. Yes, what if Mr X thinks CRS is viable? Look at city's rail map first. Link to to flickr for bigger image. It cuts through CBD. Goes almost to E-City and Jigani. Covers East side of the city. connects to airport side as well. One new line from Bellandur to Nyandadahalli, and you have good coverage North/South/East and West. Satellite stations (all IR trains terminate here), capacity upgrade, and interconnect with other modes (Metro, Bus, Parking), and some measures to discourage private vehicles - why would that not get such a thing going? See this as public welfare (which justifies monopolies like BMTC in the first place). Or see this as business - what if X thinks this is doable, and comes up with a PPP proposal. But please, do some serious talking on the subject first. Why on earth did RITES, which did the CTTP for Bangalore, propose a Commuter Rail for Bangalore? I bet they gathered enough data to see this as a viable proposition. what do they do when they have problems like this with roads and buses? they build ring roads and satellite stations. so how about ring rail? one big loop outside the city with main terminal outside as with BIAL? naveen, vasanth. was wondering why ring rail would not work. my ring was really wide. you could prolly shrink it a bit and still not loose any funcationality. but the point is it is almost like buy one get one free type of a deal. intercity trains on the ring. intracity trains on existing tracks. if you can acquire lands for PRR and ORR and BMIC shouldnt land for IR be feasible? TS, we discussed about the satellite stations earlier too. Satellite stations makes more sense than the satellite bus stands. It has also be written by a rail expert on irfca. He mentions that land within the city is so expensive to acquire, hence Metro needs to go elevated or underground which even then is an expensive. For the better utilization of existing tracks, we need to have Ring Rails and Satellite Stations or edge stations as mentioned by SB earlier. All the Intercity trains should terminate at Satellite Stations. Passing by rail can use the ring track. The city network of tracks should be used for Local Trains with small blocks. Metro fares will be expensive in comparison with locals. Locals can be afforded by all. If we have both Metro and Local to form a Network, we will have better network of mass rapid systems. I can travel to my office at Doddenakundi in just 30 - 40 minutes compared to 1 hr 30 mins now. It could be a swap deal. City or GoK builds a Ring Rail - basically by-pass routes for through trains. In return, Railways hands all or most assets inside this "rail ring" to City/GoK. City or GoK could either pass the tracks on to BMRC or BMTC or a new entity. Or, invite businesses to bid for a Mass transit PPP on these tracks. Government participation would be not in cash, but kind - lease the tracks to private party at concessional rates. Remember - there are huge new layouts being done by BDA. How and who will plan mass transit options for these new layouts? One layout is near Varthur - can be served by Bellandur station. While the 25K crore is better spent now than 100K crores in 10 years, the CRS point is not to be missed. I am sure it is still not too late to extend the train corridor on SWR tracks. Mass transport is the only way out for all Indian cities. We failed to control population let us not fail to provide mass transport. 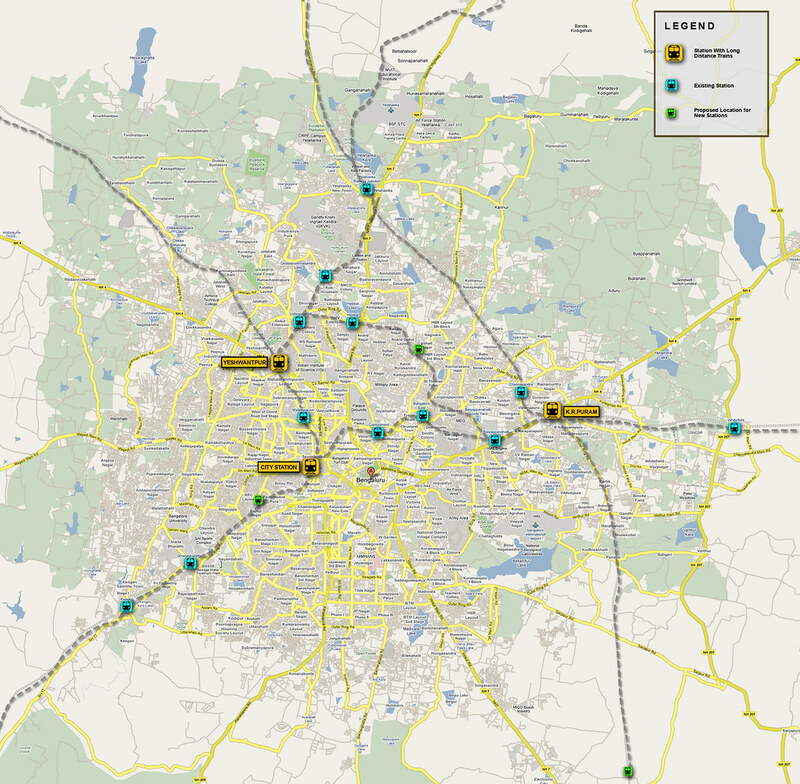 Do you support commuter rail service (local trains) for Bangalore?